I hope that you’ll look around our website, check out what this innovative publication, founded in 2002, is all about, then read some of the hundreds of articles on this site. 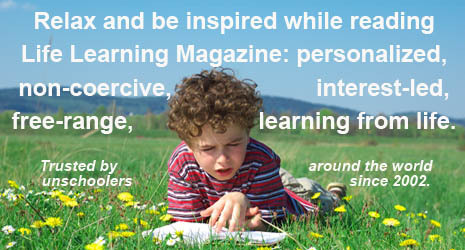 Our readers tell us that we produce unusually high quality, unique editorial about life learning / unschooling - ie. learning without attending school. Our readers live around the world and come from many backgrounds and worldviews. What you will find here is lots of respect – just like our kids deserve – as well as wisdom, encouragement, insight, inspiration, and enthusiasm about living and learning without school. Most of our articles are written by parents just like you, and young people who have walked the talk themselves. So I hope this will be a positive, comfortable, and friendly place for you to share your experiences of living and learning with trust and respect, and to give and receive support about life learning / unschooling and its effect on all aspects of life. This website provides you with an organized, focused, curated, thematic, and respectful selection of professionally edited, in-depth articles. We filter the noise so you get the information and inspiration that you want! The other thing about Life Learning is that, while we have a firm grip on who we are and what we're doing, we don't hesitate to take risks. You'll find bold, challenging new ideas as well as comfortable reassurance about your chosen path...as it develops in its own unique way. My husband Rolf and I began to unschool our two daughters Heidi and Melanie in the early 1970s. It was just called homeschooling then, and we told people that we were "living as if school doesn't exist." I have been writing about and advocating for homeschooling and life learning ever since, sometimes in the pages of my company's first publication Natural Life Magazine, founded in 1976. In the 1990s, Rolf began using the term life learning as a positive way of discussing learning and living as if school doesn't exist, and as an alternative to "unschooling" or "homeschooling." Back in the 1970s, we worked with our colleague John Holt to help families understand that they can trust and respect their children, and John consulted with us when he was launching Growing Without Schooling. When GWS ceased publication in 2001, we decided to take up where it left off with this magazine. We are pleased to offer our readers this depth of experience. My work and, by extension, Life Learning, is defined by a belief in the power of individuals to create positive change – in our own lives and beyond. Please join me and our contributors of all ages and backgrounds as this change takes shape – both in the way we help children learn and how they are treated by parents and society. Wendy Priesnitz is Life Learning’s owner and editor, and the author of a number of books on home-based education, including School Free: The Homeschooling Handbook, Challenging Assumptions in Education: From Institutionalized Education to a Learning Society and Beyond School: Living As If School Doesn't Exist. (Learn more about the books here.) She is also the mother of two adult daughters who learned without school. Wendy is an agent of change who, when she was barely out of her teens, recognized the need for rethinking how we work, play, and educate ourselves in order to restore the planet’s social and ecological balance. For the last forty-five years, her mission has been to help people understand the interconnections within the web of life on Earth and to encourage them to challenge the assumptions inherent in the often conflicting choices we make in our daily lives. 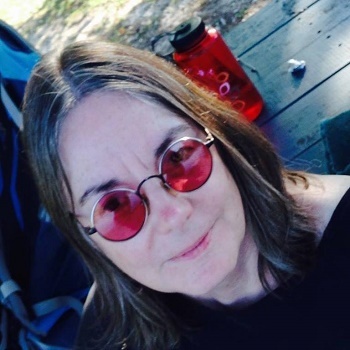 She invites her readers to take what they need from her work, but doesn't promote herself as an expert or guru, believing that each of us is our own expert. Read more about Wendy on her website.